Physician Burnout: Time to Consider a Concierge Model? Are you experiencing physician burnout? Many doctors who practice medicine in a traditional setting find that they frequently struggle with stress, facing long days, complicated requirements and changing regulations, a seemingly endless procession of patients, and no time for themselves. If this sounds like you, concierge medicine may be a better alternative. I work in a hospital setting; I’m not an employee of the hospital — I’m self-employed. There are doctors here in all different kinds of specialties, including lots of primary care doctors, and many of them are exhibiting signs of burnout. You can read about it on Medscape, or in Medical Economics, or in The New England Journal of Medicine. In articles about physician burnout and stress, the signs are pretty straightforward. Invariably the doctors look tired. They’re annoyed, they’re complaining about the computers, or the computers not working, staff turnover, and many of them are employed by hospitals, so they’ve lost a lot of their autonomy anyway. The doctors that are still in private practice, as I am, who are not in the concierge world, are struggling. They’re working hard to stay on top of all the computer requirements they’re being burdened with by the government. Staying on top of things like meaningful use, and activating and maintain a patient portal, and getting patients to come in – it’s just a myriad of things that we have to do every day that get harder and harder, and the volume just keeps getting bigger and louder. I can see it. I can see it in the faces of my colleagues. I can see it in the retirement of my colleagues. I can see it in the patients walking around the hospital who are clearly unhappy. If you’re struggling with sleep, if you’re struggling with stress, if you’re struggling with time to be at your kids’ events, or if you feel like you have to leave quickly at the end of the events, if you don’t have time for yourself to read a book or watch a show that you like, or exercise, or eat properly, or get enough water every day, then you really should be looking carefully at the choices you’re making and deciding whether it’s time for something different. 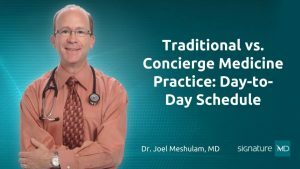 If you’re on the edge of burnout, we encourage you to learn more about the day-to-day of traditional medicine vs. concierge care.